For over a year, U.S.-China trade tensions have seized investor sentiment and dominated headlines. While tariffs and a potential resolution to the current episode are important for near-term price action, it’s only one piece of the puzzle. At Sage, we take a broader view on China and trade to determine our outlook for Asia and its effect on emerging markets (EM). The fundamental issue facing global growth is that the source of China’s economic growth is changing. The country is shifting its growth model from one of exports and fixed investment spending to consumption-led growth. Officials have attempted to rein in China’s debt levels from the high credit growth of the past 15 years, which should result in a lower, but sustainable rate of growth. U.S. exports are a relatively small contribution to Chinese GDP, and the risk of trade tensions has been more about how it could affect business and investor sentiment than the impact on economic growth. The threat of tariffs was a catalyst for last year’s EM selloff, but those risks have been mitigated given a potential trade agreement between the U.S. and China in the coming months. When we look past trade tensions, the underlying issue is that the Chinese economy is in a material slowdown. 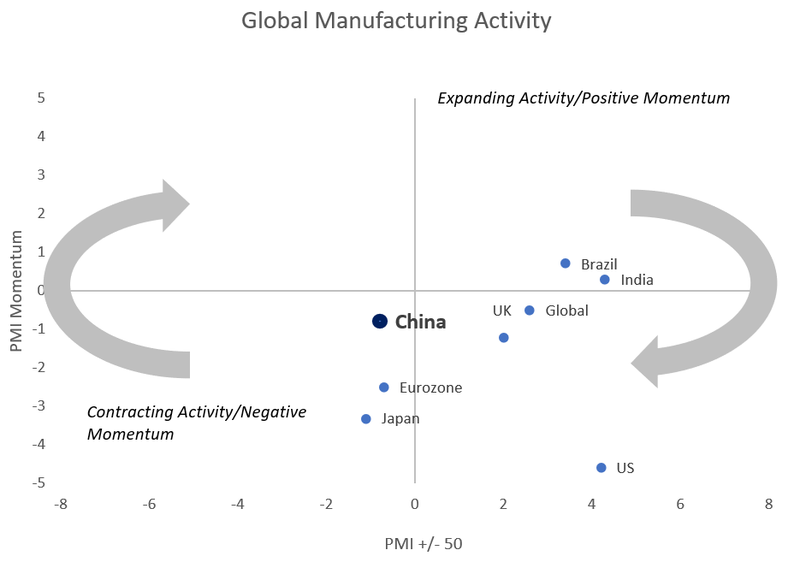 The chart below shows global manufacturing activity as measured by the Purchasing Managers’ Index, a common leading economic indicator. Chinese manufacturing activity has slowed to a level that indicates an economic contraction. Chinese policymakers have responded with fiscal stimulus but have yet to introduce a liquidity injection to boost the property sector, which was China’s playbook for 2016. While the recent stimulus measures will help, its “impulse,” the effect that it will have on the Chinese economy, may not materialize for six or more months. 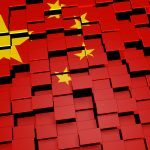 China is a huge trading partner to other EM countries, such as Taiwan and Korea, and recent figures from those countries have shown the magnitude of the Chinese slowdown. In addition, commodity exporters, such as Chile, Australia, South Africa, and Brazil, have seen exports decline in recent months. 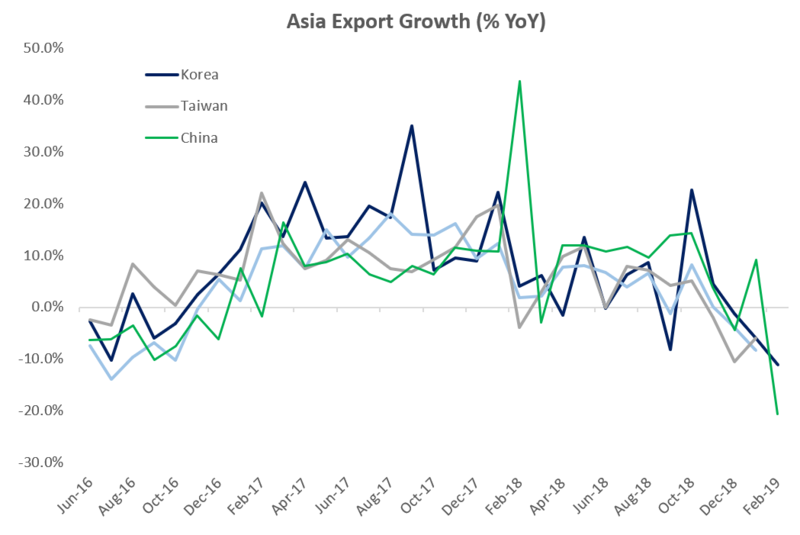 These export numbers are a bellwether to growth in Asia and have the potential to hurt investor sentiment for EM assets. Given recent strength in EM equities, particularly China, we have decided to underweight emerging markets throughout our equities, fixed income, and asset allocation strategies. 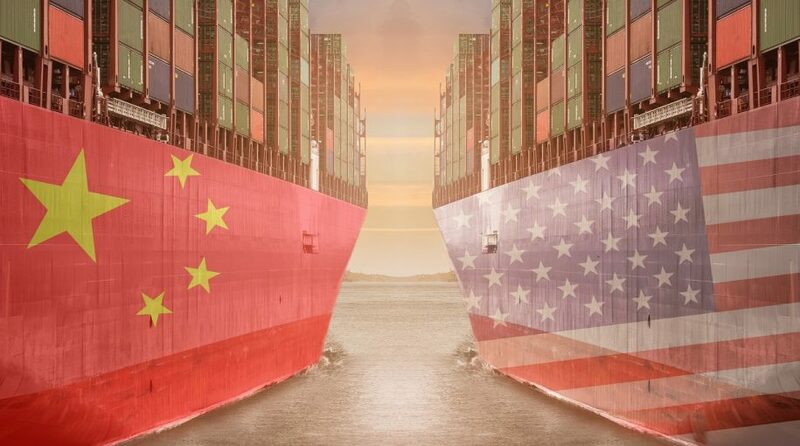 The risk to this view is twofold: 1) flows moving into China due to index inclusion (MSCI) and investor demand, and 2) the economy responding positively to recent stimulus or a trade agreement in the near term (0-6 months). Ultimately, we believe these outcomes are improbable given the rapid buildup of flows and the current extreme positive sentiment surrounding EM assets. The source for both charts are Bloomberg and Sage, as of 3/13/19.